We post a number of competitions but if you don’t have the time to go through them all then we have made things easier by choosing our top competitions for the month that you should definitely enter. Maintaining a car can be expensive, but you can ease the burden and get yourself some new tyres when you enter for a R5000 tyre voucher. Keeping your tyres in top condition ensures that you stay safe on the roads. If you are planning a party or just want to have some drinks in the house, then you could get wine and craft beer with this R2000 voucher and make sure you have always have a drink ready for any guests as well as yourself. Appliances never seem to last forever and if you need to update some of your old appliances then you might just be able to do that if you manage to win R11 000 in appliances. Need a mini break? Want to escape from your busy life? You and your partner could be heading to Cape Town for a weekend where you can relax on the beaches. Are you dreaming of a holiday? Do you want to be on the sea? You could get your hands on a cruise worth R19 000 and chill on deck and watch the world go by. Do you love to shop at Woolies? 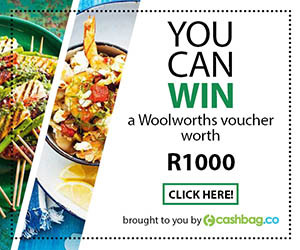 Give your food budget a boost with this R1000 Woolworths voucher or get yourself some yummy treats that you can’t find anywhere else. Are you a nature lover? Could you spend hours watching the beauty of nature? You could win a nature hamper that includes copies of Beachcombing and First Field Guide to Butterflies and Moths of Southern Africa plus a R1000 Cape Union Mart Voucher, so you can get everything for the great outdoors. If you love beer, food and cooking with fire then this is the book for you, which you could win along with a R1000 Cape Brewing Company Voucher so you have the beer you need. Ania Haie is the new name in jewellery design taking the latest trends and transforming them into affordable and quality pieces for everyday wear. Get your hands on an Ania Haie coin necklace and earring set in silver worth R1870. Your bedroom is your sanctuary, a place where you relax and sleep, so it should be a calming area that represents your personality. You could get a R2500 Linen Drawer voucher to get all the linen you need for your bedroom. These are our top picks for the month so head on over and start getting your entries in.